As we welcome the incoming Class of 2022 and kick off a new academic year, we would like to thank our worldwide family of alumni, families and friends for making 2017-2018 a vibrant year of support and communion for the Pomona community. 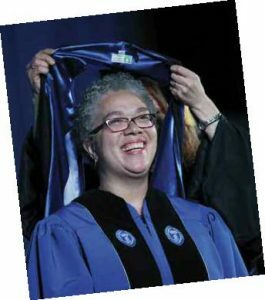 Last October, alumni and friends joined the campus community for the Inaugural Ceremony, including a barbecue and a dance party under the stars, to welcome Pomona’s 10th president, G. Gabrielle Starr. 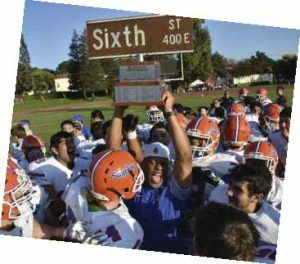 Celebratory gatherings continued on campus throughout the year, as thousands of community members returned home for Rivalry Weekend in November— Sagehens beat the Stags to bring home the Sixth Street trophy—and revitalized editions of Family Weekend in February and Alumni Weekend in the spring. Around the world, Sagehens traded stories and laughs at nine Winter Break Parties and 16 Summer Welcome Parties for incoming students and their families, and current Pomona scholars shared ideas with lifelong learners at Pomona in the City events in Seattle and Los Angeles. 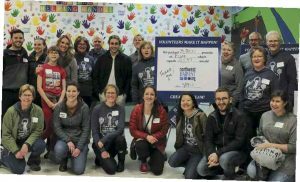 Our growing tradition of community goodwill, the 4/7 Celebration of Sagehen Impact on April 7, featured 10 alumni volunteer service events from Claremont to London and Hong Kong in addition to the now-traditional campus and online celebrations of Sagehens bearing their added riches. 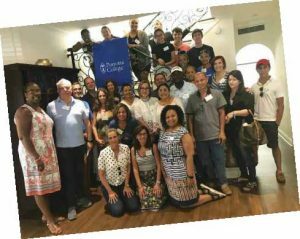 A 4/7 giving challenge to benefit Pomona’s Draper Center for Community Partnerships, the Student Emergency Grant Fund, the Alumni Scholarship Fund, and The Claremont Colleges’ Empower Center yielded $172,000 in support for students from more than 750 generous alumni and friends. 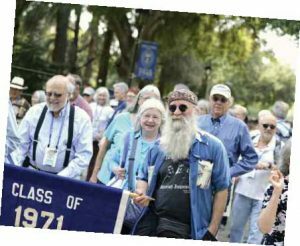 And donors to the Annual Fund set a new record with a total of $5,514,075 given, including gifts from more than 5,500 alumni whose contributions increased the College’s giving participation for the first time in more than a decade. 47 loud, proud, resounding chirps to every single Sagehen who stepped up to support our community with your generosity and your presence. Thank you! Let’s make 2018-2019 another year worth chirping about. Summer Welcome Party in Miami, Fla.
Summer Welcome Party in Denver, Col.
4/7 alumni volunteer event in Seattle, Wash.
At the Alumni Board’s final meeting of the year on June 9, Matt Thompson ’96 completed his term as Alumni Association President and passed the gavel to incoming president, Diane Ung ’85. Jon Siegel ’84 was elected as president-elect. The following members completed their service: Jordan Pedraza ’09 (Past President), LJ Kwak ’05, Kyle Hill ’09, Professor Lorn Foster (Faculty Representative), Slade Burns ’14 (Admissions Representative) and Maria Vides ’18 (ASPC President). The following new members are joining the Alumni Board: Jill Grigsby (Faculty Representative), Alejandro Guerrero ’19 (ASPC President), Cris Monroy ’14 (Admissions Representative), and at-large members Aaron Davis ’09, Terril Jones ’80, Jim McCallum ’70, Jon Moore ’86, Andrea Ravich ’06, Alex Tran ’09 and Anna Twum ’14. 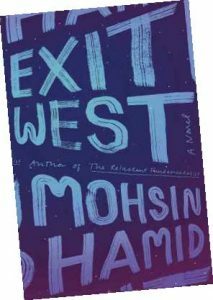 This fall, join the Class of 2022 as they start their Pomona journeys by reading Exit West, a book The Los Angeles Times called “…a breathtaking novel by one of the world’s most fascinating young writers.” Named a Top 10 Book of 2017 by The New York Times, Mohsin Hamid’s work follows two lovers displaced by civil unrest in their home country. 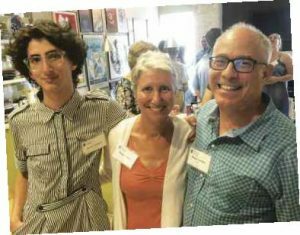 In-person Book Club events for the summer/fall selection began in August in Washington D.C., Seattle and Honolulu, with additional gatherings planned this fall in St. Paul, MN (September 21), Bedford Hills, NY (October 16) and Austin, TX (October, date TBD). Join the Book Club to learn more about events near you and to read along with alumni, professors, students, parents and staff around the world. Save the dates for these favorite annual events and update your contact information to hear about more opportunities to come together with the Sagehen community.